Exadata Version 2 – final blow to Oracle/HP relationship? It took Oracle buying SUN to finally come out with something worthy this relationship — Exadata Version 2. Oracle has killed two birds with one stone capitalizing on their superior Oracle Enterprise Linux and SUN’s x64 hardware, once again proving that it’s bet is on OEL not Solaris. Oracle/SUN claim that by using X4275 they were able to significantly simplify storage solution eliminating complex SAN architectures. Here’s a brief overview of the architecture – Sun Oracle Database Machine and Exadata Storage Server. 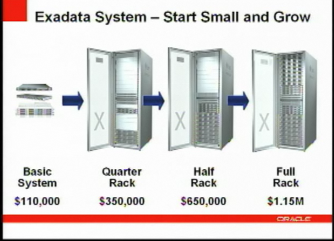 And here’s the presentation Larry Ellison gave at The Sun Oracle Database Machine Announcement. So is Exadata Version 2 a final blow to Oracle/HP relationship? Time will tell, all I can say is that we couldn’t be happier with our HP hardware running Oracle Application Servers, Oracle RAC and various middle-tier solutions on Oracle EL.